Diabetics used to be told that they shouldn't eat any sugar, sweets or desserts. However, it is not the amount of sugar you eat that matters the most, but your total carbohydrate intake, according to the American Diabetes Association. Carbohydrates are not only found in sugar, such as in honey, maple syrup, white sugar, brown sugar and agave syrup, but are also present in large quantities in grains, starchy vegetables and fruits. You should restrict your carbohydrate intake to 45 g to 60 g per meal for best blood sugar control, according to the American Diabetes Association. Honey, like all other sugar, is a concentrated source of carbohydrates. A tablespoon of honey provides 17.3 g of carbohydrates, while a teaspoon has 5.8 g of carbohydrates, according to the USDA National Nutrient Database. Although these amounts may appear small, it can add up quickly depending on how much you use at one time. It is a good idea to track your carbohydrate intake. Write down the food you eat, with the corresponding serving size, and estimate the carbohydrate content of each of these foods using food labels or food composition tables. Add it up and make sure that each of your meals provide no more than 45 g to 60 g of carbohydrates. If honey can fit within your carbohydrate budget, your blood sugar control should not be impaired. Honey is often considered a healthy sweetener when compared to white sugar or high-fructose corn syrup. Although it is more natural and less processed, it still contains about the same amount of sugar as any other type of nutritive sweeteners. For example, 1 tsp. of granulated sugar has 4.8 g of carbohydrates, 1 tsp. of brown sugar has 4.5 g of carbohydrates, 1 tsp. of corn syrup has 5.6 g of carbohydrates and 1 tsp. of maple syrup has 4.5 g of carbohydrates. The amount of carbohydrates matter more than the quality of the carbohydrates when it comes to diabetes. Sugars have different proportions of sucrose, which is a molecule formed by a glucose bond with a fructose, free glucose and free fructose. All of these fall in the category of carbohydrates and impact your blood sugar levels in a similar manner. Half of the sugar in honey is found in the form of fructose, which can be a concern for diabetes because of the way fructose can adversely impact your blood lipids, especially your triglycerides, according to the January 2008 issue of "Diabetes Care." Avoid consuming high amounts of fructose to prevent cardiovascular diseases. If you enjoy the taste of honey and wish to add a touch of sweetness to your diet, try to keep the amount you eat very small. For example, you could add 1/2 tsp. of honey to your tea, to plain yogurt or to your oatmeal. 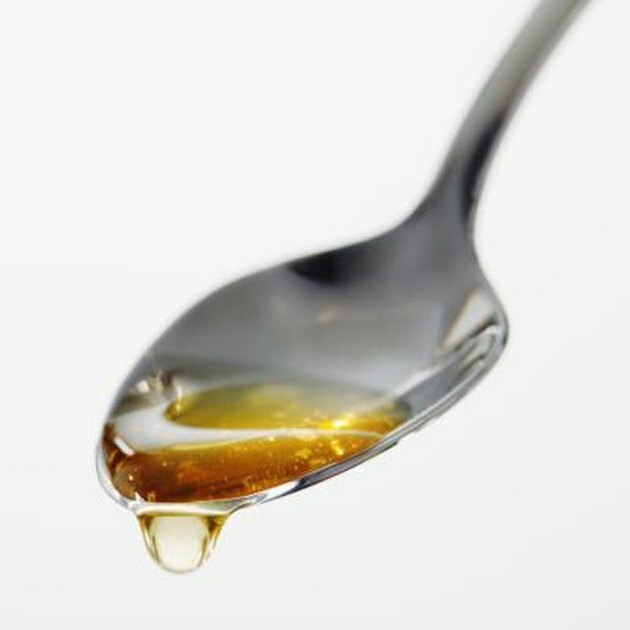 Although this amount is small, your taste buds will adjust to a lower sugar intake and you will be able to detect enjoy the subtle flavor of honey in smaller amounts, while keeping your diabetes under control.